Playing cards with integrated circuits? 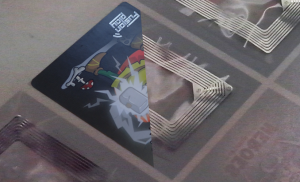 Mockup of a card with an integrated NFC chip. Image: FusionPlay. Editor’s note: This story was last updated on July 14th, 2017 in order to reflect the outcome of the kickstarter. According to the kickstarter running until July 14th, FusionPlay Heroes is “the first mobile Near Field Communication (NFC) card game”. Its unique selling point: All cards contain integrated NFC chips. Via the NFC Chip, the cards can be read by a smartphone positioned in the centre of the table. The smartphone scans the cards that are played, processes the turn and manages the state of the game. FusionPlay Heroes is a two-players game. Both players choose from one of four heroes, each hero coming with a six-card deck. Gameplay with cards and smartphone. Image: FusionPlay. Near Field Communication (NFC) is a communication standard for exchanging data across a distance of up to ten centimeters. Only one communicating device has to be powered, the other can be passive and leverage energy harvesting. NFC readers are integrated into most current smartphones. Third-party NFC apps such as FusionPlay Heroes, however, are only available on Android phones, since Apple reserves the NFC interface for Apple Wallet and Apple Pay. NFC is commonly used for contactless payment, maintenance, advertising, product authentication, and more. How does the game make use of the technology? The gameplay video below, which I recommend watching, showcases a sample game: At the beginning, the smartphone is positioned on a tray and both players scan their hero card. Every turn, each player plays a face-down card by sliding it under the smartphone. The app scans the cards and processes the turn. Depending on the offensive or defensive cards played, the heroes gain or lose life, positive or negative status effects. The app also enables random results, such as critical hits. The NFC integrated circuits are provided by German company Smart-Tec. According to the kickstarter, the combination of physical cards and smartphone app unites the advantages of mobile games (easy to learn rules, automated state of the game) and card games (personal interaction, bluffing, real emotions). Hard not to think about Magic: the Gathering and Hearthstone here. The integrated NFC chip is not visible from the exterior. Image: FusionPlay. The team around game designer Konrad Kunze has tackled a sizeable challenge for their first game. There definitely is potential in the technology used for the game. Integrating ICs into cards might open up new concepts for card games. In the end however, only one question remains: Is FusionPlay Heroes a good game? After all, the technology’s role is to support the existing principle of play, not the other way around. As a complexity addict, I am skeptical about the six-card decks. Does the comparatively low number of possible combinations enable enough valid strategies to create replay value? Do the features of the app add enough gameplay value to justify the effort of NFC integration? Only an in-depth gameplay test will be able to shed light on these questions. Story and graphic design are subjective. That being said, neither the game’s backstory (a malfunction of the Large Hadron Collider pulls heroes from the time-space continuum) nor its heroes (a Germanic thunder god, a Japanese Samurai cliché, a knight without a sword and a young woman teaming up with a spider) seem particularly fleshed out or compelling to me personally. I might be in the minority on this assessment, though. Donar, “the Germanic God of Thunder” and one of the playable heroes. Image: FusionPlay. If you’ve become interested in FusionPlay Heroes, you can support the game: the kickstarter will run until July 14th. The starter pack for 27 Euros includes two of the four heroes, backing the game with 57 Euros will get you all cards (for the first 100 backers respectively, all further packs will cost 34 and 64 Euros). The project is all or nothing, meaning that if it does not raise the full 10,000 Euros, all pledges will be refunded. As of today, with 48 out of 60 days remaining, the kickstarter campaign has raised over 2,500 Euros. According to donation tracking tool kicktraq, it should end up raising around 13,000 Euros. 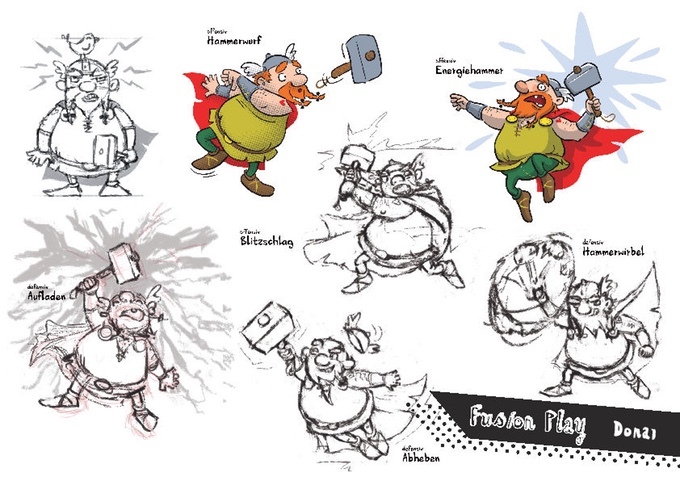 The kickstarter for FusionPlay Heroes has failed in a rather spectacular manner – less than 3,000 Euros have been raised. According to kicktraq, this suggests that a large donation was pledged first, hoping for a snowball effect which ultimately failed to materialize. Um, think about adding pictures or more spacing to your weblog entries to break up their chunky look. Neat idea, but it won’t translate into mtg. mtg is just too old to use new technology like this. they tried w/ the holograms, players hated it. I think it won’t work. People want to play a card game, or they want to play a game on their phones – not both! JoTheDecuk: NFC isn’t some “1984 ****”, it’s just a technology that helps us identify everyday objects. It won’t bring about the apocalypse, you will not get a chip implanted en route to the surveillance state, and the men in black won’t come to your house. Chill out. has many names that are applicable: the glass person, the Trojan horse (brain and gland manipulation), the sign that gets under the skin (implant in the body) or The sword inside (Harakiri sword), because it is not from the outside but the inner center meets, namely the ego or the soul. The goal of the NWO with its king, the Antichrist (Order: Soul Abduction), is to create a tight network of frequency machines worldwide that will not leave any gaps and ultimately run across our body in the form of the RFID implant, so we would manipulate a remote-controlled frequency Becoming a robot society without identity. Program of the committee of the 300 point 4: The establishment of thought control techniques with the aim to create human robots, which react to external impulses and control. Item 14: On the spread of religious sects, e.g. how to force the Muslim Brotherhood or the Sikhs to carry out mind control experiments similar to what Jim Jones did in his camp in Jonestown, Guayana, before the 900 or so followers of his Peoples Temple were killed or killed by order ( 1978). Just accept that the mere mention of RFID drives people crazy and move on, folks. Belgian companies are actually making great progress on RFID gaming cards! Thanks for the spam, random Belgian guy! I’m not sure how this discussion ever made it this far. Where’s 4chan when you need them? Pisicchio on Playing cards with integrated circuits? Thog on Playing cards with integrated circuits?